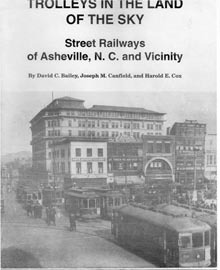 Source: “Trolleys in the Land of the Sky – Street Railways of Asheville, N. C. and Vicinity.” Written by David C. Bailey, Joseph M. Canfield, and Harold E. Cox. 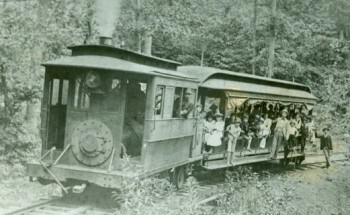 The early history of Asheville rolling stock is incomplete. There are no surviving records, except for a cryptic inventory made at the time of the Asheville Street Railway’s receivership in December, 1892. Certain details can be deduced from trade magazines, occasional pictures, and scattered builder’s records. However, car renumberings which took place when all of the local street railways were taken over by Asheville Electric were not re-corded and a complete list cannot be reconstructed from the data available. The original equipment of the line consisted of three closed cars with 16-foot bodies built by the Gilbert Car Company of Troy, NY, delivered in late 1888 or January 1889. Four open cars were acquired in the spring of 1889. An additional closed car appeared in the fall of 1889. 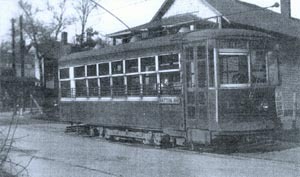 Car #9, probably closed, was added in the spring of 1890 when the North Main Street line was completed. Car 10 first appears in 1891 and car 12 in 1891 or early 1892. The latter two were apparently second-hand closed cars. The builders and origin of cars 4-12 are unknown. There were also three non-passenger trailers, numbers 11, 13, and 14, described below. 1 Thomson-Houston motor in bad order. The original closed cars apparently remained in service during the 1890s with no new cars being added during that period. However, the open cars were gradually replaced. 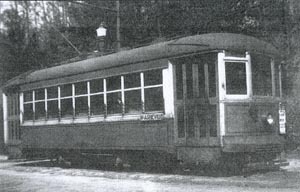 Two 10-bench open cars, numbered 13 and 14, were received from Jackson & Sharp, a builder located in Wilmington, Delaware (serial numbers 779 and 780) on 22 May 1896. They were part of a canceled order for the Washington & Great Falls (DC) Electric Railway and were equipped with Bemis trucks and GE 800 motors. Two 8-bench Jackson & Sharp opens were acquired in 1897 (s/n 956, 957; probably numbered 4 and 5) and two more in 1898 (s/n 1112-1113; numbered 6 and probably 7). They replaced the system’s original open cars. The first electric car of the West Asheville and Sulphur Springs was built by the Ellis Car Co. of Amesbury, Massachusetts. This was ordered by the Thomson Houston Electric Co. which contracted to build the line. By late 1894 the WA&SS was reported to have five motor cars and one trailer. Some or all of these were built by John Stephenson & Co. of New York City but it is not known if they were new electric cars or converted second-hand horse cars. 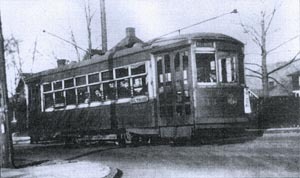 WA&SS cars were painted brown, a color not normally used for streetcars. They provided a sharp contrast to the red of the Asheville Street Railway cars. When the WA&SS suspended service at the end of 1895 the cars were stored. The cars were apparently acquired by the Asheville & Biltmore line when the WA&SS property was divided between Asheville Electric and the A&B in 1898. The Asheville Loan, Construction & Improvement Co., later the Inter-Montane RR, had only two closed cars when it opened in 1891. There is no record of the builder. The ALC&I cars were equipped with enclosed platforms in 1892, the first such cars in Asheville. 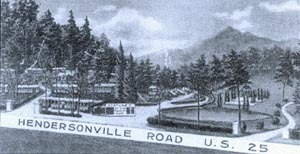 In contrast the Asheville Street Railway did not provide begin to provide their motor-men with protection from the weather until late 1900. One 8-bench open car was purchased from Jackson & Sharp, serial number 992, in 1898. A second open car was acquired in 1901 from an unknown source, and may have been built locally. All four cars be-came the property of Asheville Electric. Number 50, a 1916 Brill semi-convertible stands at the Grove Park Station at the end of the Charlotte Street line signed for West Asheville in the summer of 1934. John R. Wilmot. The Asheville & Biltmore reported six motor cars and one trailer in 1899. This included three open and two closed from the WA&SS, and car number 6, a second-hand 16-foot closed Brill from an unknown source. [page missing] …ton were also aware of the virtues of standardization and in 1905 began re-placing the entire stock of closed cars with Brill semi-convertibles, a job which would take until 1913 to complete. Semi-convertibles were a solution to the problem of providing a car for all seasons. Previously, it had been necessary to provide two sets of cars, one open and one closed. This was an expensive approach as well as one which did not provide for sudden changes in the weather, such as thunder storms. Numerous all-purpose designs were created, none of which worked particularly well and most of which did not permit the sides of the cars to be closed in quickly if a storm arose. The use of canvas curtains lowered on the sides of open cars during sudden storms led to an environment inside the cars which has been described as similar to a dark wet cave. Car 112, a 1925 Brill single-door Birney inbound on East Street bound for Patton Avenue in the summer of 1934. John R. Wilmot. Brill convertibles, like cars 56 and 58, had removable sides, but these were usually stored and unavailable in the summer. When fall came, broken windows would be found, or car frames might have shifted enough to require corrective ac-tion to get the sides to fit. Asheville inherited two convertibles, but bought no more, apparently waiting for a better solution to the problem. The solution was the semi-convertible. Brill created a car in 1900 with windows which could be raised into roof pockets, providing ventilation in hot weather and protection when the rains came. By 1905, the design had become popular and Asheville Electric purchased two (Brill order 14516) mounted on Brill 21-E trucks for fall delivery. While most Brill semi-convertibles were double-truck cars, Asheville bought only single-truckers. No double-truck passenger car was ever operated by the Asheville city system. The cars were 20 feet 8 inches long over the body, 29 feet 8 inches over the vestibules, and 31 feet 4 inches over the bumpers. The interior finish was cherry in natural color. The semis remained in service until the coming of the Birney cars in 1924. Eight were retired about 1926 and an additional six in 1927. leaving six in reserve for emergencies. 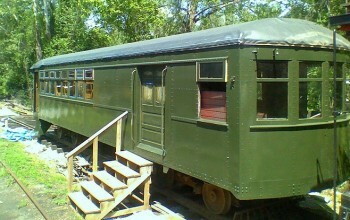 Car 113, a 1926 Brill double-door Birney on Merrimon Ave. signed for Biltmore in the summer of 1934. John R. Wilmot. By the time of Asheville’s last deck-roof semi-convertible order in 1913, the car type was already becoming obsolete. Accordingly, when Asheville Power and Light purchased six more cars in April 1916, Brill order 19935, they decided on a more modem design. 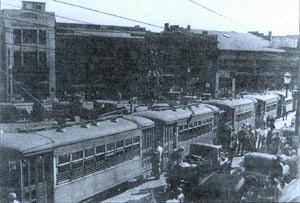 The cars, numbered 42 to 52 (even numbers only), were destined for service on the heavily-trafficked Montford Ave.-Depot via Southside route. While the cars were similar to other cars being built at the time and were the first arch-roof cars in Asheville, only twelve cars were ever built to this specific design, the other six being built for York Railways in Pennsylvania at the same time as the Asheville cars. The cars were unusually long to be mounted on a single truck, being 22 feet 11/2 inches over the body and 35 feet long overall. York Railways used Brill 21-E trucks on their cars. However, Asheville mounted its cars on Radiax E-I trucks. These were extremely long single trucks which were not rigidly mounted on the frames and which could (in theory at least) negotiate sharp curves without derailing. The combination of extra-long cars and radial axle trucks created a unique car never again duplicated by Brill. The arch-roof semis remained in service until abandonment in 1934. By the time that AP&L was trying to create a bigger single-truck car in 1916, other small city operators were already experimenting with new lightweight designs, the lightweight car market eventually coming to be dominated by the Bimey car, named for its designer Charles O. Birney, an engineer for Stone & Webster, a company which controlled numerous small-town lines throughout the country. Asheville was slow to adopt Birneys. While most small-town operations who could afford them hastily converted to Birneys just after World War I, Asheville waited until late 1924 before it ordered its first Birneys and began to convert its weaker lines to one-man operation. There are many possible reasons for this reluctance to change. The layout of the Asheville system meant that there were a number of points where large crowds would be picked up and discharged. The traditional two-man crews and cars, which had doors at both front and rear, allowed faster loading and unloading. Standard Birneys used a one-man crew and had a single door at the front. Part of the seven-car fleet which participated in the last streetcar run lines up at Pritchard Park on Labor Day, 7 September 1934. Pack Library. Additionally, the Asheville system had newer cars than many systems of its size when the Birneys came on the market and were not under pressure to upgrade. Still, the decline of business in the automobile age and the increasing cost of operating the old two-man semi-convertible fleet led to a conversion in the traditional Asheville manner — most of the cars in regular service being replaced by a fleet of 24 Birneys between 1924 and 1927. All but 123-124 were purchased new. The last two were acquired second-hand (Baltimore, Maryland), where they were numbered 4001 and 4002. They were used to support increased service on the light-traffic lines. Cars 101-112 were standard double-ended Birneys on Brill 79-E- 1 trucks with a single door at the right side of the platform on each end. These were used to replace the heavier two-man semi-convertibles the light-traffic lines. After abandonment, many of the former Asheville streetcars were used to provide housing at Fortune’s Street Car Tourist Camp, located south of the city on Route 25 at Valley Springs. Pack Library. 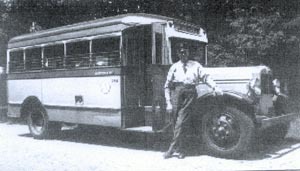 Carolina Power & Light purchased 25 Corbitt buses with Hackney bodies and seating 21 passengers each to replace the street car fleet in 1934. John R. Wilmot. This was a rare design found only in a handful of cities. While the standard Birney was only 28 feet 1-1/2 inches long, the Asheville two-door version was nearly five feet longer. Because of the weight the cars rode on Brill 79-E-2 trucks, a heavier version of the standard Birney truck.